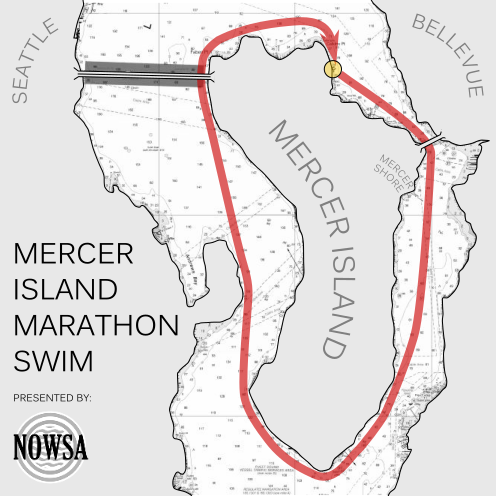 The Northwest Open Water Swimming Association is hosting the 3rd annual "MIMS" (Mercer Island Marathon Swim) on Friday, May 24, 2019. Mercer Island sits in Lake Washington just outside Seattle. Distance around = 20k, no current, temperature likely to be in the low 60s, and on a sunny day the scenery is absolutely spectacular. Swim on Friday and stay to explore the NW over the long Memorial Day weekend. Registration (application process for ~20 spots) will open in early January. Specific date, time and process TBD. Cost is TBD too, we're still working on the budget. Additional details about the event, are not yet available on our website, but hopefully we'll get to those soon too. Please subscribe to this post for updates about all of the above. Post questions here so that others can enjoy the answers. Or if you're shy, contact me via email: racedirector 'at' northwestopenwater.org. Forgive slow answers, 'tis the holiday season. Thanks for the interest. Looking forward to seeing you in May! Just curious because I don't know the area well...How is the wildlife there? Any concerns about sharks or whales? @BigGuppy412 Most of the wildlife you'll see will be flying overhead - eagles, ducks, seaplanes. Lake Washington is fresh water, so no sharks or whales. There was a sighting of a 6-7' sturgeon last summer, but the chances of anyone seeing that again are extremely rare! Ready to volunteer again if you need me, Liz . I swam this last year if anyone wants advice. This year I’ll be support paddling! I'm pretty slow. What's the time limit? I am slow too, hopefully not too slow to do this event... I'll be watching for the registration information! Are local volunteers able or willing to paddle for out of town swimmers? Do we need to arrange our own kayaks? @dpm50 @MeesaGonnaSwim - the time limit was 9 hours last year. Most likely we'll keep it the same again this year. Depending on conditions, ability of boats to stay on the water past 9 hours, plus other factors may affect whether or not the limit will be strictly enforced. @VanCornwell - at this early date, we do not have local volunteers lined up for paddling. We will be working with a local kayak shop though to arrange for renting boats to out-of-towners who bring a paddler with them. Fee for this is TBD. Thanks for the info! Travel budget is a factor... have a possible trip to the left coast for a family reunion, but dates haven't been set. Howdy folks and happy new year! Making your swimming plans for 2019? If so, then you'll be ready to register for MIMS on January 7! Look for a registration link here at 7 am PST on Monday the 7th. Registration is open for the 2019 Mercer Island Marathon Swim - sign up here! NOWSA held the first 20k Mercer Island Marathon Swim ("MIMS" for short) in 2017. The event is inspired by the old MIMS in New York: it is meant to be a day where swimmers can meet each other face-to-face and share in a marathon swim that is both challenging yet approachable. MIMS is being held on Friday, May 24, 2019 in Lake Washington (Seattle). It is not a warm swim. The temp at this time of year is usually in the low 60s. Swimmers should be prepared for cold temperatures, and also prepared to prove that they have adequate experience and training during the application process. You'll find some additional talk about the event here. There's lots of info about the event on NOWSA website event page as well. 14 swimmers are registered for the 3rd MIMS. We have room for 6 more and are keeping registration open indefinitely until full. Interested? Get in touch with any questions or just CLICK HERE to learn more and sign up. Please also spread the word - thanks! Everyone is now listed on our website: https://northwestopenwater.org/mims-swimmers , and we'll continue to update that page as we fill our last four spots!